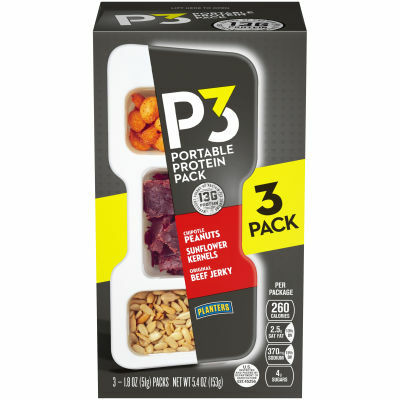 Planters P3 Chipotle Peanuts, Original Beef Jerky and Sunflower Kernels - This portable protein tray packs a combination of three immensely delicious components. Succulent beef jerky, spicy chipotle peanuts and subtly seasoned sunflower kernels make for a combo to enjoy anywhere. - A Scrumptious Fusion of Protein, Flavors and Textures - Whether you are on a long trip, out in the wild seeking adventure or want a snack on hand on busy days, this proteinpack is a great choice and fits easily in a travel bag. Serving size 1 Package (51g).